In a small bowl, mix the yeast and sugar with 3 tbsp of luke warm water and let it sit for about 10-15 mins. In a mixing bowl, add the flour and yeast mixture and add about 2 cups of water to make a stiff dough. 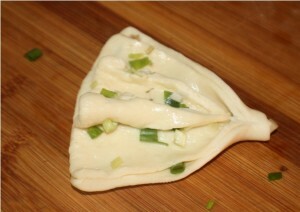 Keep mixing until you have a dough that holds together and doesn’t stick to the sides of the bowl. Adjust the amount of water, adding more or less as is needed.Turn the dough out onto a lightly floured surface, and knead until it is smooth and elastic (about 10 minutes). 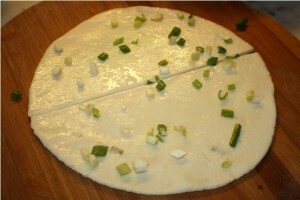 Cover the dough and let it rest for about 2 hours. At the end of this time, the dough will have doubled. 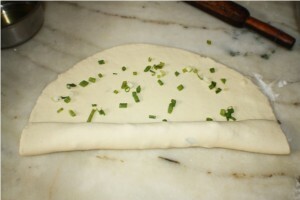 Punch the dough down to remove all the air and knead for 10-15 mins. Now comes the fun part. 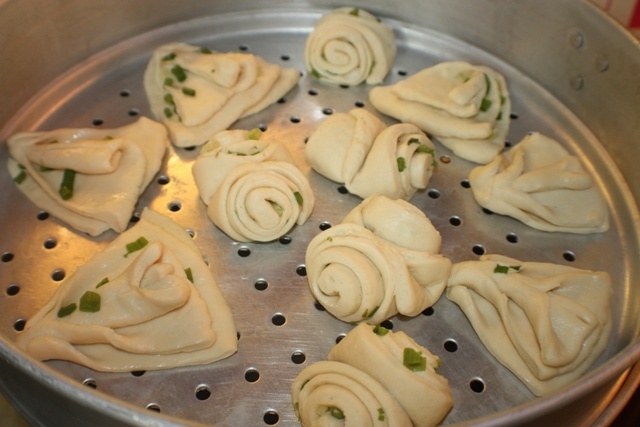 Making the flower rolls. There are many ways in which these flower rolls can be shaped. I choose the two easiest one which I could replicate at home. 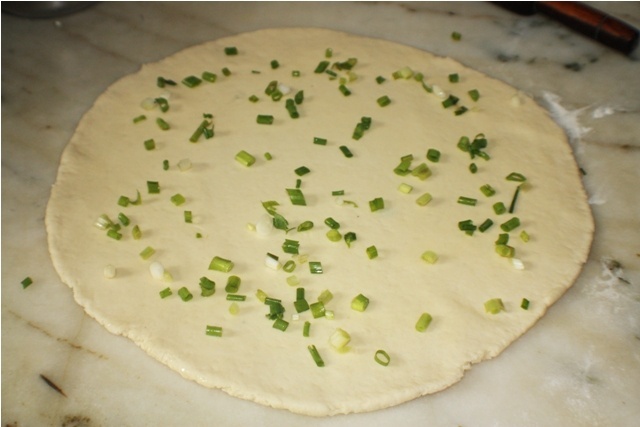 Using half the dough, roll out into a big circle or preferable rectangular shape. 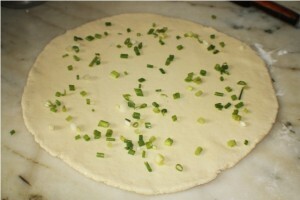 Rub with oil and evenly sprinkle the chopped green onions. Take each piece and, with the cut sides facing outward, using a chopstick or something similar to press down lengthwise in the middle. 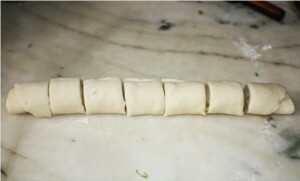 Press down firmly enough so that the layers on each side spread outward, but not enough to cut right through the dough. 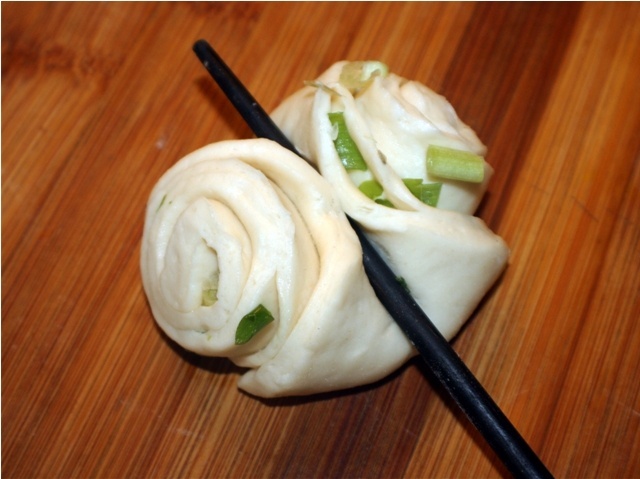 Your Flower shaped bun is now ready. Repeat the process till all the dough is used up. Make a 2″ dough ball and roll it out like in the shape of a medium size roti, about 6 inches wide. Rub with oil and sprinkle the chopped green onions. Cut into two equal parts. 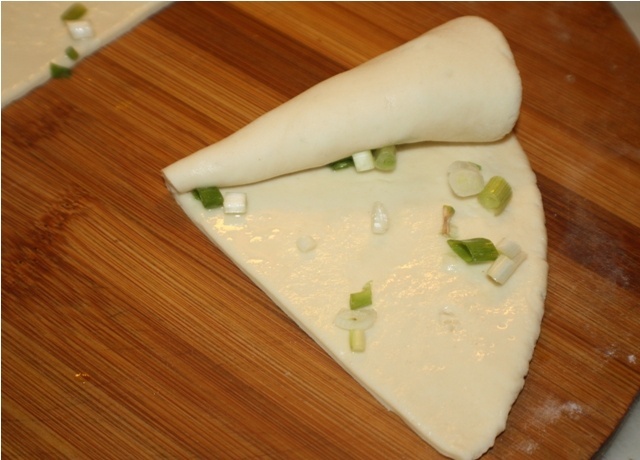 Roll each half of the dough into a cone shape. 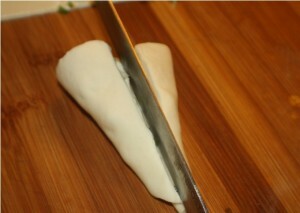 Using a sharp knife, gently slice the clone leaving the ends intact. Gently open up the layers of the dough to give it a nice shape. After making each bun, place them on a greased steamer. 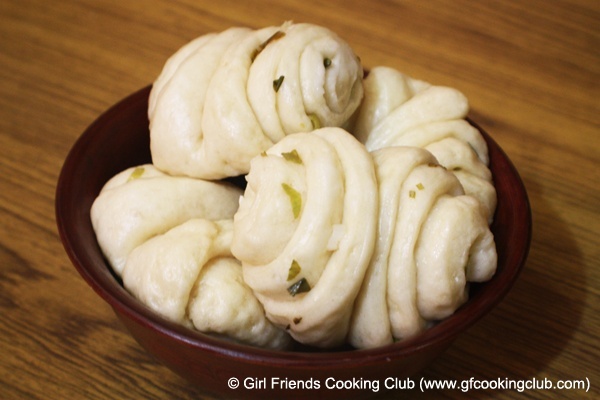 Make sure you keep sufficient space between the bun as they expand when they are steamed. Let the buns, sit for an additional 20 – 30 mins before you steam them. 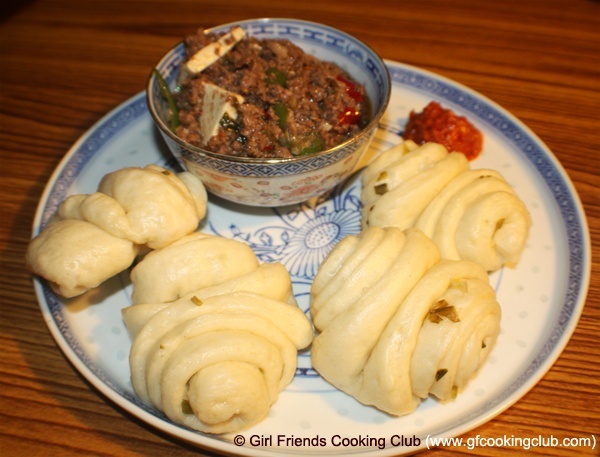 You can use this time to prepare the meat or vegetable curry to eat with the buns . Try the Tofu & Minced Meat curry. Steam for 20 mins and serve hot with the curry of your choice. 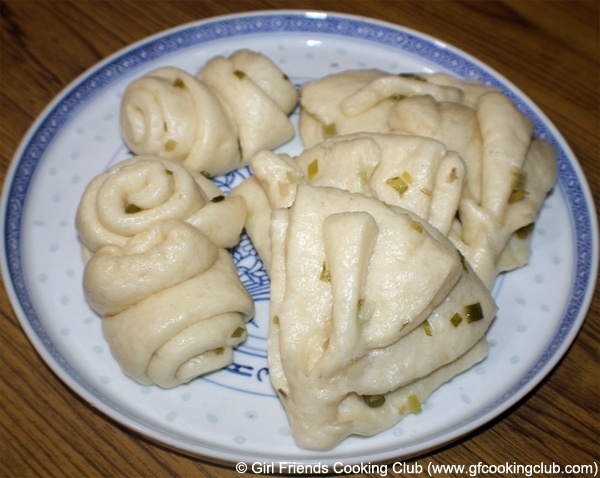 This entry was posted in All Recipes, Breads/Cakes/Rotis/Parathas and tagged Steamed Buns, Ting Momo, Tingmo by Kamakshi. Bookmark the permalink. They are not chinese… Tingmo are tibetans!